PvP 4-piece set bonus for Holy Paladins has been redesigned. Eternal Flame orWord of Glory now also reduces damage taken by the target by 5% for each Holy Power consumed (maximum of 15%) for 6 seconds. This effect only works in PvP combat. One of the changes coming is that all specs of all classes will have an “attuned” stat. This comes in the form of an ability that you will gain at level 90. The idea is that it will be a boost to whichever stat lets you character do it’s main job better, whether that’s healing, DPS, etc. It will also give you a clue as to where to stack additional stats when you’re give a choice. Since reforging will be gone the only way to do this will be through various effects and picking one piece of gear over another. These are all passive and all boost the appropriate stat by 5%. Intellect no longer provides an increased chance to critically strike with spells. The base chance to critically strike is now 5% for all classes. There are no longer different chances to critically strike with melee, ranged, and spells. Various spells and abilities will offer increased chances to crit, as well as your gear. Strength will provide no Crit bonus and the Parry that it provides will be reduced. Hit and Expertise are going away. Reforging will be dead. Any abilities, such as Holy Insight, or racials that would increase either stat will either be changed or removed. This leaves you will a 100% chance to hit opponents of up to three levels higher than yours (eg: Bosses.) There will be a chance to be parried, but all tanks will have an ability that will reduce that. The Prot. Pal’s ability, Sanctuary, will reduce the chance for attacks to be parried by 3%. Bonus Armor: Increases Armor and Attack Power for tanking specializations only. Parry and Dodge on existing gear are being changed to Bonus Armor. Multistrike: Grants a chance for spells and abilities to fire up to 2 additional times, at 30% effectiveness (both damage and healing.) See below for abilities that deal with Multistrike. Readiness was going to be a new level 90 ability that reduced the cooldowns on various abilities. Right now it looks like that has been shelved. Probably permanently as a major stat, though it might still show up on a trinket or two. Some abilities will be restricted to one or two specs, see the sections below for those abilities. The idea here is to streamline things, remove excess abilities (buttons,) zap redundancy, and so on. For Paladins, the pruning focused on removing niche abilities, and trimming cooldowns. Divine Favor has been removed. Hand of Sacrifice is now off of the global-cooldown. Redemption’s mana cost has been reduced by 95%. Selfless Healer no longer causes Bastion of Glory to apply to Flash of Light. The Level 30 talent Evil is a Point of View has been removed and replaced with Blinding Light. The level 30 talent Repentance‘s cast time has been increased to 1.7 seconds. Eternal Flame’s periodic healing effect has been changed. Its duration now scales with Holy Power, instead of its healing. Its effect at 3 Holy Power remains unchanged. Your Seals will no longer cost any mana. Basically Bliz feels that healers are too powerful, so they’re going to make a few tweaks. They’d like to see players spending a bit more time at less then 100% health, without necessarily increasing their danger of actually being killed. They will also be trying to adjust things so that healing abilities don’t scale out of proportion to health pools and content. Multi-target heals will be tweaked in a similar fashion, making them heal less or sometimes cost more mana. As a result, the amount of Parry gained per point of Strength has been reduced by 25% and items in Warlords will lo longer have either stat. Various effects might still add to your parry. Vengeance has been removed and replaced with a new passive ability, Resolve, which increases your healing and absorption done to yourself, based on Stamina and damage taken (before avoidance and mitigation) in the last 10 seconds. Riposte is a passive ability (level 76) for Protection Paladins and other plate-wearing Tank specializations. Riposte has been redesigned to convert Critical Strike into Parry, a defensive stat. That also helps keep secondary stats balanced in offensive value for you. Sanctuary now also reduces the chance for attacks to be parried by 3%. With Mists of Pandaria and future items Dodge and Parry have been replaced with Bonus Armor. If an item had both Dodge and Parry on it, it has been replaced with an additional useful secondary stat. Head, Chest, Hand, Wrist, Waist, Leg, Feet, Weapon, Shield, and Off-hand items that had tanking stats (Dodge, Parry) or healer stats (Spirit) have been replaced with a different universally useful secondary stat. Avenging Wrath is no longer available to Protection Paladins. Bliz tweaked the level 45 talent Eternal Flame in order to reduce its massive self-healing amount, and provide better balance between talents on that row. Sanctified Wrath was changed to buff it further, in order to give Protection Paladins more burst threat and damage, while retaining its core damage-splitting identity. It now increases the damage of Holy Wrath by 100% and causes it to generate 1 Holy Power. Hand of Salvation is now only available to Protection Paladins. Grand Crusader now triggers from any avoidance, not just dodge and parry. Guarded by the Light now also makes Word of Glory and Eternal Flame instant cast. Want to play a tank in PvP? It hasn’t been viable for awhile, but Bliz would like to change that. Tanks will do somewhat more damage, have a lot less Crowd Control (CC) available, and they’ll be a bit squishier than otherwise. The goal is to do both less damage and to take less damage than DPS classes. We made several changes for Holy, to go along with other larger system changes to compensate for the removal of Guardian of Ancient Kings from Holy, and merged its benefits into Divine Favor. In order to follow through on our change to merge all types of Haste %, we removed the Spell Haste % from Seal of Insight to a Holy-only passive, so that it didn’t also increase Protection’s baseline Haste by 10%. Our changes to healer mana and mobility also indirectly increased the value of Selfless Healer by a large amount, so we brought it back down to be even in power with the other talents on its row. We also raised the range of Denounce to be consistent with other spells. Lastly, we adjusted the critical strike chance of Holy Shock, to increase the value of Critical Strike for Holy Paladins. Avenging Wrath now also increases all of the Paladin’s healing by 20% for its duration. Seal of Righteousness is no longer available to Holy Paladins. Seal of Truth is no longer available to Holy Paladins. Divine Light has been renamed to Holy Light. Judgment is now naturally free for Holy Paladins. Tower of Radiance’s effects have been merged into baseline Beacon of Light. Supplication now also increases Flash of Light’s healing by 50%. The level 45 talent Eternal Flame now has a 1.5-second cast time (up from instant cast) for Holy Paladins. Looks like Retribution is getting off rather lightly this time around. I guess Bliz is pretty happy with the spec. Judgments of the Bold has been removed. Judgment now naturally generates 1 Holy Power for Retribution Paladins. The Art of War’s effects have been merged into baseline Exorcism. Sanctity Aura is a new passive ability for Retribution Paladins which grants 3% Versatility to the Paladin and all allies within 100 yards. Sword of Light (Retribution) now also makes Word of Glory and Eternal Flame instant cast. Also see our post on all of the new talents, for all classes. Note that in a numbers of cases each spec actually has access to different talents. Holy gets Beacon of Faith: Beacon of Light can now be placed on two targets. 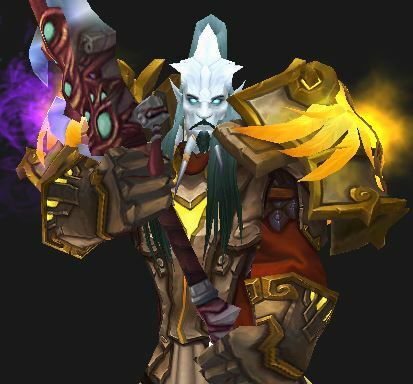 Ret & Prot both get Seraphim: All of your secondary stats (Haste, Crit, Mastery, MultiStrike, Readiness, Versatility, and bonus armor) all get increased by 30% for 10 seconds, with a 30 second cooldown. Holy‘s talent is Saved by the Light: When your Beacon of Light target drops below 30% you instantly grant them a shield equal to 30% of their health for 10 seconds. You cannot shield the same target twice within one minute. Protection gets Holy Shield: Increases your Block chance by 10%, spells now have a chance to be blocked, and each block deals Holy damage to the attacker. Retribution has Final Verdict: A mighty strike, doing all of the damage as Holy. It also increases the radius and damage of your next Divine Storm, both by 100%. Replaces Templar’s Verdict. Glyphs will also have categories and you will only be able to load one glyph from any one category at a time. For example, the Glyphs of Hand of Freedom and Liberator are in the same category. Glyph of Ardent Defender: Ardent Defender no longer reduces damage taken, but if its duration expires without being consumed, its cooldown will be reset to 60 sec. Glyph of Cleanse: Now has two charges, but also has a +4 second cooldown. Glyph of Hand of Freedom: Hand of Freedom immediately reduces the remaining duration of all effects which cause loss of control of a character by 25%. Any additional loss of control effects applied within 4 sec have 25% reduced duration. Glyph of Judgment: 10 yards additional range. Glyph of the Liberator: Reduces Hand of Freedom’s cooldown when not used on yourself. Glyph of Merciful Wrath: Reduces the cooldown and effect of Avenging Wrath by 50%. Glyph of the Consecrator: Your consecration effect moves with you. Sweet. There are no changes to the minor glyphs, so far. Beyond that level 90 ability that adds 5% top one of your stats all of your new abilities, from 91+, will be perks. These don’t add to your button list, they’re all “passive,” and what they do is enhance an existing ability. Examples are 20% more damage or 20% faster cooldown. In earlier WoD builds there were 9 perks for every spec of every class. At the moment there are four. I assume, like everything else, this will change. Also, the perks are learned randomly. At level 91 you will learn your first perk and it will be randomly picked from the available list. As you go on you’ll get the rest, randomly, until you have them all. Empowered Beacon of Light – your single target heals to 10% more healing to your Beacon of Light target. Enhanced Holy Shock – A chance for your next Holy Shock not to trigger a cooldown. Improved Daybreak – 100% more healing from Daybrak. Improved Forbearance – 30 second reduction of Forbearance. Empowered Avenger’s Shield hits two more targets. Improved Consecration – 100% more damage. Empowered Divine Storm – 25% chance, when using abilities that consume Holy Power, to improve your next Divine Storm. Enhanced Hand of Sacrifice – cooldown reduced by 30 seconds.